Everyone is prone to having vertebral subluxations which eventually lead to a number of health problems. Physical causes like poor posture, improper work ergonomics, and injuries due to accidents, are common triggers. In addition, emotional well-being is also a factor that should be considered. Stress, depression, and anxiety can put your overall wellness at-risk. As such, it is important to keep all these factors in check. This is the aim of chiropractic, to provide you with all-natural and holistic approaches in achieving optimal health. 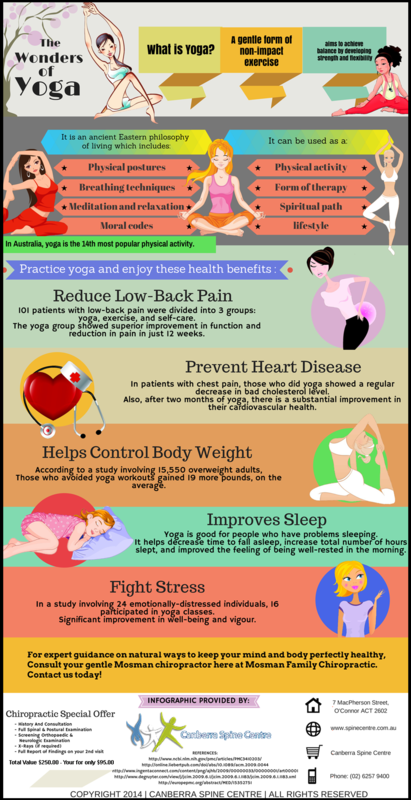 In addition to getting regular chiropractic care, yoga is also becoming very popular today. In addition to making your body a lot stronger and more flexible, yoga has many other health benefits. It significantly helps in keeping your mind and body in excellent condition. Experience the many benefits of the chiropractic lifestyle today here at Canberra Spine Centre. Your gentle chiropractor in Canberra is committed to empowering you so that you can make better-informed decisions when it comes to the total well-being of your entire family. Call us today on (02) 6257 9400 or simply book your appointment online.